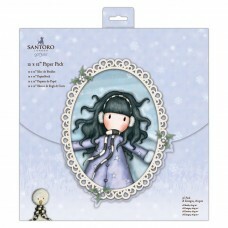 "Discover Santoro's Gorjuss in a whole new setting with the Gorjuss Christmas collection. For the first time ever you'll find the 'gorjuss girls' in a variety of wintery environments sporting snuggly bobble hats and festive jumpers surrounded by classic Christmas icons like frosty snowflakes holly and poinsettia. This 12 x 12"" paper pack features brand-new designs in a range of festive reds and greens as well as classic Gorjuss shades of purples and blues. "